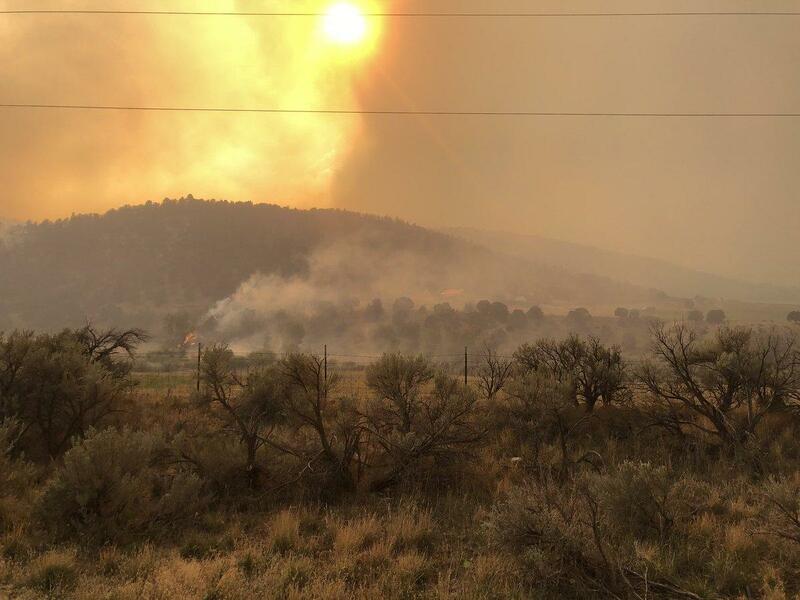 SPANISH FORK, Utah -- A swift Utah wildfire fanned by high winds has more than doubled its size as it burns through dry terrain and forces evacuations of hundreds of homes, the U.S. Forest Service said Friday. The blaze south of Spanish Fork grew to 84 square miles from 31 square miles Thursday night when authorities ordered evacuations in three communities. Lorene Miller told CBS affiliate KUTV that she has lived in the small community of Woodland Hills for 12 years and it was the first time she had to leave her home. She loaded up her kids' baby pictures and videos and fled when authorities raised the alarm. The hot, windy weather that has created tinderbox conditions in the area is expected to continue into the weekend. The fire is also threatening to converge with a second, smaller fire. Sparked by lightning in a forested, rough terrain on Sept. 6, the fire raged out of control amid high winds and was only 2 percent contained Friday. The fire has also forced road closures, including U.S. Highway 89. Utah Lt. Gov. Spencer Cox, a Republican, criticized that decision made during drought conditions -- calling it "inept decision making" in a tweet. KUTV reported that air quality conditions reached "unhealthy" levels in Utah County as wildfires were burning. Residents in the county or those near the fires, were advised to limit their amount of time outside. In Montana, Gallatin County officials said Thursday that a smaller fire about 40 miles northwest of Bozeman burned three houses earlier this week, as well as two "secondary residences" and seven outbuildings. The structures were all damaged Monday near the community of Clarkston, which is along the Missouri River. The 2-square-mile fire chewing through grass and juniper was 33 percent contained Friday morning. The cause of it has not been determined.